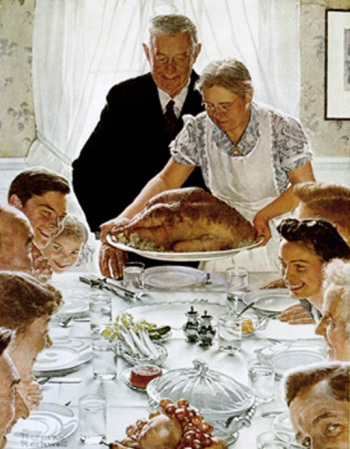 As Thanksgiving and the winter holidays draw near, we often imagine Norman Rockwell-esque gatherings. Elaborate and delicious meals, the sounds of convivial conversation, the feeling of warmth that comes from time spent with family. I think for most of us, it is these things that come to mind, even if we haven’t personally experienced these things in our own lives. We imagine a time in the past when things were better, and from that false memory, complain about the present. I’ve noticed that among my Chinese friends, the topic of discussion has been more frequently focused on China’s current woes. The other day, one co-worker was disgusted by the deaths of over 20 children in a school bus crash, and the other one talked in hushed tones about how the gov’t only wants to enrich itself. A new issue arises every day, and the feeling becomes that China’s current situation is worse than ever. Their statements suggest there was a time when things were “better”. We can even see this effect in even farther looks back, a recent Op-ed in the NYT claims that China’s Confucian dynasties ruled with benevolence. Throughout China’s history though, the average person was often seen as having little worth to the state, and life expectancy did not increase beyond 35 between 0-1800. As Sam Crane points out in a recent post on The Useless Tree, Legalism, not Confucianism defines China’s past imperial powers; and that since the first emperor, dynasties have been primarily concerned with expanding state power and territory, and silencing dissent. China has never been a better place to live. Compared to 221BC or 1949AD, I would argue that almost every aspect of life has been improved. Women have a much better standing in society, basic education and literacy are nearly universal, the standard of living has improved in every corner of the country, and information is more widely available. This is not to say that there is no work left to be done, and is in many ways more a reflection of how difficult life was in the past. And yet, I still meet people who look back fondly. One friend described the fun of singing Red Songs with her classmates during the Cultural Revolution, and even sang me a few verses, beaming with joy. When the song concluded, she told me how the Red Guards had locked her father in his own classroom for days. As a result of her parents’ concern for her safety, she was adopted by her uncle. Yet somehow, when she was refused the “opportunity” to be sent to the countryside for education through labor, she was incredibly upset. It is an extreme understatement to say that most Chinese over 40 years old have a difficult relationship with their own histories. Part of what is underlying this rosy recollection, is what came after the Cultural Revolution – the fall of Maoist ideology and China’s opening up. These changes brought real opportunities to the masses for the first time in generations. There was a sense that people could suddenly become rich, and that anyone with enough pluck could quickly climb the social ladder (in line with the idea of a Confucian meritocracy of the past). And so as we embellish our own memories of the past, as do our Chinese friends much to the Party’s Chagrin. The Party tries to herald it’s progress and China’s bright present, but they are finding that it is very difficult to compete with a past that never fully existed. If the Party hopes to maintain it’s grip on power, it can finally acknowledge the mistakes of the past, which it could distance itself from, to emphasize their progress; or it can continue to pursue its path of Legalism with a benevolent facade. By T in Economy & Development on November 23, 2011 . When I was in North Korea this summer the vast majority of the tourists were Chinese. A lot of them miss real socialism. Everybody was poor but they were equally poor and their problems were simple (as long as they steered clear of politics). No corrupt neighbors in BMW’s to make them feel inadequate. No stresses of the corporate world. They were hungry, but close to one another. Those insane rallies also gave a feeling of euphoria that nothing today could match. I felt that atmosphere in North Korea a bit and have to say it’s certainly not without it’s charm. As I understand it, there was a split in academia (zhishifenzi) that started in the 90s: those who remembered the CR fondly, and those who didn’t (to say it crudely). This split still remains today, and it plays out in different forms. I understand why people would remember it fondly; the community, sense of general purpose– basically everything stated about. I wonder if the nostalgia stems more from an attitude of hopelessness and defeat as opposed to remembering how good things really were. Because as I’ve heard other 40-plus people say, anyone who speaks fondly of the CR is kidding themselves. That is to say, the prevailing attitude that the system (be it politics or culture) is stronger than the self lends well to nostalgia. Perhaps no matter what happened in their youth, the middle-aged folk of today, under the pressure of modern society, long for whatever came before modern society — who cares if it was a time of poverty, labor, family shame, and ideological monotomy (re: those issues have not been replaced by anything correspondingly better). This is probably just a generational characteristic. I have also heard of the nostalgia of 80/90-hou for their childhood. I always thought this was universal (adults remember childhood fondly), but perhaps that is the nostalgia of the succeeding generation: for the times when there were fewer worries and no modern-life pressures…ie. childhood. I can think of a far better way to understand this Chinese point of view. Specifically, try listening to it and believing it. I wonder, if I were to walk to the corner where the hei che (黑车) drivers gather, or perhaps to the park where other groups of middle aged or pre-retirement age xia gang (下岗) men and women gather, or to another street corner where the casually employed men seek work with their cardboards signs, or even to if I were to visit the home of a jianbing street vendor whose once flourishing business has been arbitrarily regulated out of existence; if I walked to one of these places and asked if things were better in the 90s or the 80s or even, yes, the 70s before these people were laid off in the prime of their income earning years; or if I asked them if they enjoy sitting on these corners and living in urban shanties more than living in their hometowns and villages with their families; if they told me, “No. Things were better in the past”; I wonder, if I did these things and listened to what people had to say, would I conclude that they were speaking under the illusion of a past that didn’t exist as they remember it? Or would I reflect upon my own partial and flawed knowledge/point of view and consider revising it? I would agree, that there are people who are thinking back to a time when things were better for them personally. However the people I referred to in this piece are all fully employed in good fields (above average salaries too). They own their own apartments, and have chances to travel abroad. That is what makes these conversations so unexpected. “Looking at the past with rose coloured glasses” is a world wide common sense belief. I think that Tom is right to target the over 40’s here. Erik Erikson wrote persuasively about psychosocial development achieving different stages in the individual. Specifically, those aged 40-65 have, according to Erikson, reached the stage he called Generativity versus Stagnation. It is common at this stage to assess one’s achievements and life goals and mourn lost or missed opportunities (mid life crisis anyone?). Suffice it to say that the future of China rest solely in the hands of the CCP and its governing ways. It’s hard to imagine that there will be any significant change coming soon that would benefit all of the Chinese people. If you look at what they’re doing for themselves in relation to what they do for their citizens, it’s not hard to see that it will be a very long process before China becomes a better place to live for the masses. I personally believe that China will self-implode economically and culturally due to the current path is it on under the direction of its Party Officials. The rest of world is already on this path and it’s just a matter of time before it hits China. Unfortunately, when this happens, the global effect will be devastating since China is currently buoying the rest of the world for the most part. The times are a changin’. I agree with you to a degree. It seems like China is coming apart at the seams; out of control local gov’t debt, shadow lending, a property bubble, extra-legal detentions, illegal demolitions, land grabs…But all of these things have been simmering under the surface for years. After watching how quickly things shut down when there were whispers of revolution last January, I am doubtful that the party is going to loose control anytime soon, but will instead gradually reform. And while the Party will control what is or isn’t changed in the short run, the pace of these changes will be dictated increasingly by the people. Yes, Tom, and yes, Meryl. But I hold to my alternative explanation with an additional caveat: recollections of the past are a remembrance of concrete conditions that were in some dimensions better than today, social solidarity and the iron rice bowl being only two of these. I suppose I will be chided for not being constructivist or postmodern enough, but, with due respect to Erik Erikson, not everything is a creation of the mind. Implicit in Tom’s post is the notion that material advancement is the only criteria by which the past and present ought to be measured. It’s hard to reconcile this idea with the critique of Chinese materialism in a previous post. Perhaps this is partly the result of ethnocentrism; more likely, it is in indicator of the near total colonization of the “Western” mind by market ideology. With respect to the group that Tom speaks of in his post, Isn’t it possible that, relative material prosperity having been obtained, that these people object to their alienation from family, friends, and community? That they don’t like being physically separated from their families? That they object to the ways in which their relations with others are becoming more and more market-based? How about the possibility that people simply don’t feel right at doing so well in such an manifestly unequal society? Contrary to what the Ayn Randian and Hayekian readers might say, isn’t it possible that living under such conditions constitutes an affront to some natural human drive to justice and equality? Having said all of this, I think that a more relevant criticism of looking to the past is that it is not the best way to formulate progressive political action in the present and for the future. Still, we also know that conservative and reactionary urges are very powerful political motivators, perhaps even more powerful than hope for a fairer world. I’d also like to point out how curiously contradictory the content of this blog (especially the comments) are on this matter. When railing against the injustices of the present (also very real), we chide “the Chinese” for being passive. When these same people pine for the past, we call them dreamers, suggesting that they have faulty memory. Once again, our lack of capacity for self-reflection, never mind the tolerance for self-contradiction, is jarring. With respect to the topic at hand, we really ought to consider that our own historical progressivist lenses are at least as rose-coloured, perhaps more so, than those we hold are wrongly clinging to the past. Here’s a different idea: get your mind of the present! A very interesting point and one with which I hold some agreement. The term “better” is relative and we should not automatically discount the experiences of people to suggest that their memories are faulty based on our readings of historical texts or other sources. (I think it was you who recommended a recent book by a Chinese author who fondly recalled the Cultural Revolution which took me by surprise and made me rethink some of my earlier thoughts. But that is another thought for later.) This does not mean that the general narrative of the Cultural Revolution being a terrible time for the nation as a whole is necessarily wrong but that people may hold different points of view on the subject – especially when viewed through the rose-colored lenses that people tend to hold on any subject of their own personal history. I would like to point out a fallacy in one of your statements – “…constitutes an affront to some natural human drive to justice and equality.” Are you really suggesting that the drive to justice and equality is a natural human attribute? I would suggest that the opposite is true and history is replete with examples where people’s natural drive is to better themselves and justice and equality were pursued where it only interacted with the desires of oneself. This does not mean there are exceptions but they are just that – exceptions. Finally, as someone pointed out, when we forget the pain of the moment we tend to only see the positive when comparing the past to the present. Certainly this is the case with many Americans who pine for the good ol’ days of the 1950’s when things were obviously like Norman Rockwell paintings – which, if true, seems unlikely that the revolution of the 60’s would have occurred if things were so wonderful. Or the Russians who pine for a return to Communism and its privations in the former Soviet Union because things were so much better than compared to today. The sad reality is that we as humans tend to regard the present as the most important and, oftentimes, as the worst of times – especially when compared against what we fondly remember as the better past. Another way to consider it is that people tend to try to block out bad memories which means that those memories left of the past have had the pain removed and all we recall are the positive things (again, not an absolute, merely a tendency). Your points are well taken, Chopstick, but if you have a second look at my post, I’m not so certain about the claims I make about good human nature. As far as examples go, the practice of politics and popular history is very much about finding the exceptional rather than the commonplace. It would be a dark world indeed that did not operate mainly on the principles I suggest. Having said this, my view on human nature above amount to my hope for human nature, which means that it is as much about the way I prefer to deal with others in the world. Clearly the real world is ambiguous, although what is often claimed to be human nature is little more than a “natural” response to human made environment. This is most obvious in the case of “free markets.” These are typically promoted in part with reference to their suitability to some innate human tendency. Of course there is nothing innate about those tendencies; that free markets have to be “promoted” is telling. At any rate, my daily dealings with people, not to mention my research, tells me that the instrumental approach to others is not the only that people relate, though it is more dominant in some places. Where it is dominant, it is the result of aggressive political interventions. You are very right, however, to point out that as a matter of “scientific fact,” this matter is far from settled. To the extent that it ever is, we should pay attention to power rather than nature as an explanation. As to the book I recommended, I think that it is one that looks back on the 80s rather than the Cultural Revolution. The pining in that text is for what the author sees as a more perfect market society rather than what he sees as the present corporate plutocracy. Of course there are books that are more generous about the GPCR. One by an author called Mobo Gao (The Battle for the Past: Mao and the Cultural Revolution) comes to mind. That book is, in many ways, an apologetic text, but I think we should be more generous towards what those authors point out. What they remember fondly is, as Tom pointed out accurately, a simpler, more egalitarian vision of the world. As above, I don’t disagree with the point Meryl makes, but I think it’s worth pointing out the role that psychoanalysis plays in placating a suspicious population. Think of all those “mentally unstable” trouble makers in modernist totalitarian states past and present. As to those Russians that pine for communism, I doubt that they are concerned with one party rule so much as looking to the past as a way of a) holding present leaders to account (as in China) or b) holding out hope for a future in which its rulers are something other than modern day robber barons. A modest vision to be sure, but there are worse things than hoping for such a future.